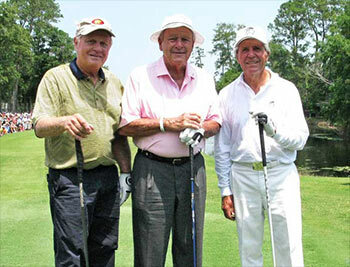 The Big Three returns to the stage Saturday for another encore. For the second consecutive year, Insperity Championship patrons and a national television audience will have the opportunity to see long-time friends and legends Jack Nicklaus, Arnold Palmer and Gary Player compete in a special “The Greats of Golf” competition Saturday afternoon at The Woodlands Country Club Tournament Course in The Woodlands, TX, outside Houston. The Insperity Championship, which is played today through Sunday on the Champions Tour, will again feature a special one-day event featuring 12 golf legends, who will play in threesomes and compete in an 18-hole scramble format. The event is reuniting not just the Big Three, but the “Big Four” of Nicklaus, Palmer, Player and Lee Trevino, and welcomes newcomers such as Johnny Miller and Raymond Floyd. The 2012 event, which gave a record number of golf fans the unique opportunity to watch the legends play together, was supposed to be a one-time occurrence. But strong demand called for an encore. This year, the Big Three will compete against the team of Trevino, Floyd and David Graham; the team of Dave Stockton, Miller and fellow newcomer Tony Jacklin; and, finally, the trio of Don January, Gene Littler, and Charles Coody. The Greats of Golf event will be shown as part of the Golf Channel’s broadcast of the second round of the Insperity Championship. Saturday’s round will air tape-delay from 6:30–9:30 p.m. ET on Golf Channel, and will re-air Sunday morning 2:30-4:30 AM ET. Admission, as it is all week, is free for the event, which will begin close to 12:30 p.m. CT (1:30 p.m. ET), following the last tee time of the official competition. Last year it was a time to reflect and remember, but also to rewind the clock for some of the participants. Nicklaus reminded thousands in Texas and perhaps millions on TV why he is the greatest player in the game’s history, as the then 72-year-old icon conjured up a swing and a game reminiscent of the one which totaled 120 professional victories and a record 18 major championships. The Golden Bear teamed with Palmer and Player for an 11-under total, as they took a two-shot win over their fellow greats. “We didn’t make any bogeys, we made a few birdies and we hit a few nice shots and had a great time,” Nicklaus said of last year’s match. “And that’s what this was all about. Although Nicklaus jokes that he plays only once a month, this will be his second competitive appearance in 12 days. The Golden Bear partnered with Player in the Demaret Division of the Liberty Mutual Insurance Legends of Golf, finishing tied for seventh after rounds of 69-66. Saturday’s dozen greats includes eight World Golf Hall of Fame members, has more than 300 PGA TOUR victories, over 50 major championship titles and more than 150 Champions Tour wins. The Insperity Championship, the 8th of 26 official events on the Champions Tour schedule, benefits local Houston charities. The tournament is also a partner with the Houston affiliate of the Susan G. Komen for the Cure and will “pink out” on Saturday in support of breast cancer awareness. For updated information on The Greats of Golf and all aspects of the Insperity Championship, fans are encouraged to visit www.insperitychampionship.com.